We leave the city of Huaraz at 9:00 am and visit the town of Recuay, which retains its streets and houses in colonial style. Then we will see Ticapampa and Catac, where we enjoy a coca tea at the Zoroche. Then we take a dirt road detour to the Pachacoto ravine., where we reach a small lake called Patococha, home to migratory wild ducks. 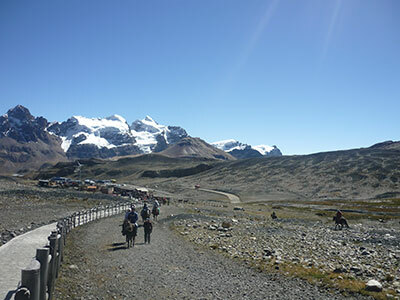 From there, we will stop at the Huascaran National Park to register to enter, with many creeks visible below Pastoruri. Next, we will see the Puya Raimondi, which hosts the largest flowers in the world. From there we will see a small lake called Pumapashimin. Afterwards, we will see petroglyphs, and then we will travel to the bus station (4800m), to depart from the bus and begin our walk to the glacier. 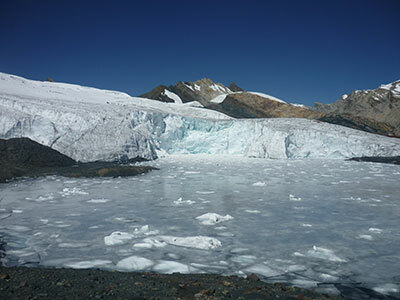 We will spend approximately thirty minutes walking on the glacial ice at a height of 5000m.